There are a lot of steps in making croissants, and we will break them down for you so you feel confident when you go back home. You will learn how to make your own starter, also known as poolish. 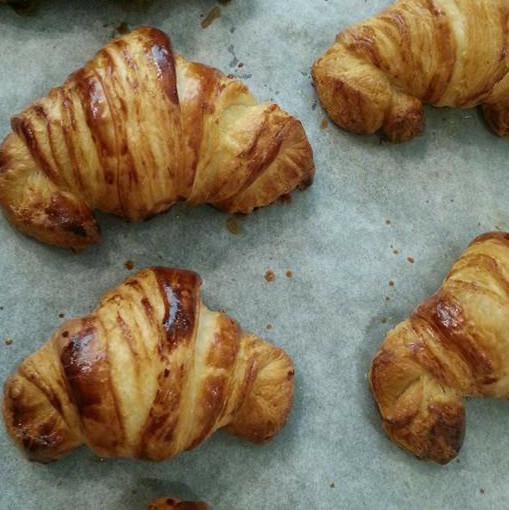 You will practice all the “turns” necessary to make a true French croissant, and learn the difference between a croissant “au beurre” and a croissant “ordinaire”. You will learn all the tricks to roll croissants to their so characteristic shape and what type of chocolate to use for Pains au Chocolat. And then, you will of course bake them, so you can eat the freshest croissant you will ever have. So, after making your croissants, we will taste them at teatime and share some of our stories about French culture and … croissants of course! Last but not least, you will leave with a box full of Croissants. Yum.